Jimmy Cricket caught up with some old friends during his summer season in Norfolk. 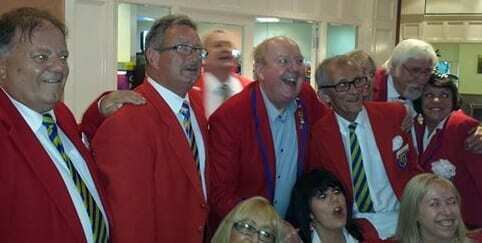 The well-known comedian was headlining the Great British Seaside Special at the Princess Theatre when he visited by some of his former Redcoat colleagues from the Butlin’s holiday site in Clacton-on-Sea. 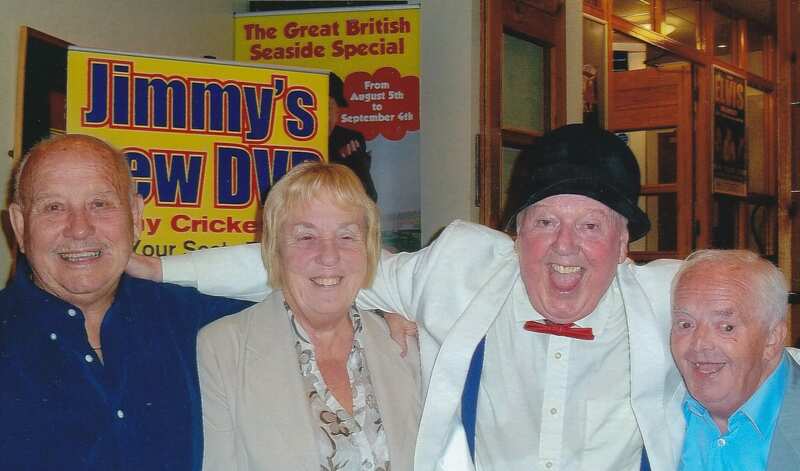 Frankie Whittle and Ernie Shrimp and his wife all went to watch Jimmy’s show in Hunstanton and chat about the old times afterwards (picture above). 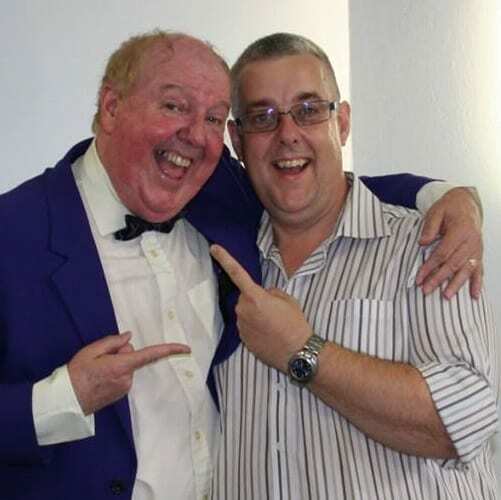 This picture featuring well-known entertainer Jimmy Cricket has been published on a Facebook group page. 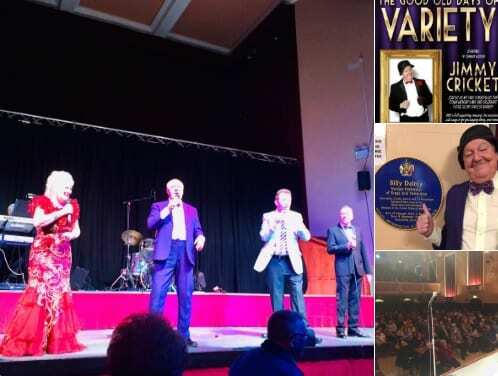 Seen with Jimmy in the foyer of the Embassy Theatre in Skegness is Carl Lawrence who posted the photo in his own Facebook section and also on the group one at Keep Variety Alive (you need to be logged into Facebook to view this page). Carl had come to see the 2013 Music Hall Tour, which Jimmy has headlined over the course of the summer at various venues around the UK. The show was well received during its July visit to the Embassy Theatre; in fact, about 600 people came to watch the show and Jimmy said he was thrilled with the attendance. The Music Hall Tour, which is produced by Mark Andrews Productions and features all the typical hallmarks of a ‘Good Old Days’ format, resumes in September for the autumn leg which includes visits to Redhill, Crewe, New Brighton, Nottingham, Dudley, Cardiff, Harlow and Soham. * More details for each date can be found in the tour dates section of this website. 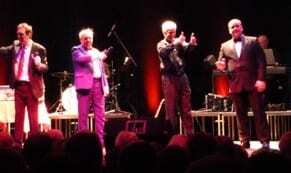 Jimmy Cricket visited the Corn Exchange Theatre in King’s Lynn as part of the 2013 Music Hall Show tour around the UK. The Irish comedian is headlining the national tour, which is produced by Mark Andrews Productions and features all the typical hallmarks of a ‘Good Old Days’ format. It continues at Skegness on Wednesday, 24 July and then, in the autumn, the show visits Cardiff, Nottingham, Harlow, Soham, Redhill, Crewe, New Brighton and Dudley. More details for each date can be found in the tour dates section of this website. A big thank-you to Gloria Whitbread for sending in these photographs. 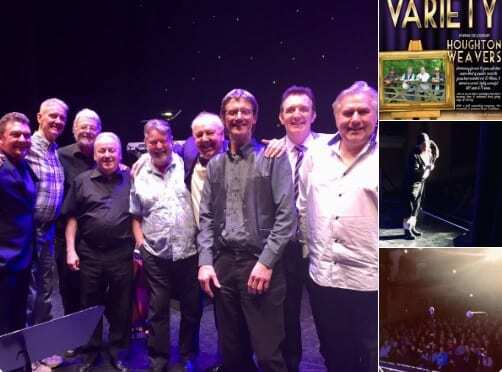 Well-known comedian Jimmy Cricket and the cast of the music hall show with whom he has been touring had a couple of shows in the East Anglian region on consecutive days. First, they visited the Corn Exchange Theatre in Ipswich and then went to King’s Lynn the following day. After the Ipswich date the entire company travelled to a village called Long Sutton, which is near King’s Lynn, in preparation for the next day’s show. On their arrival at Long Sutton, they all had a meal together at the nearby Ship Inn. Above, Jimmy is shown with the cast, the producer of the show, Mark Andrews (of Mark Andrews Productions) and Katie, the waitress at the inn. 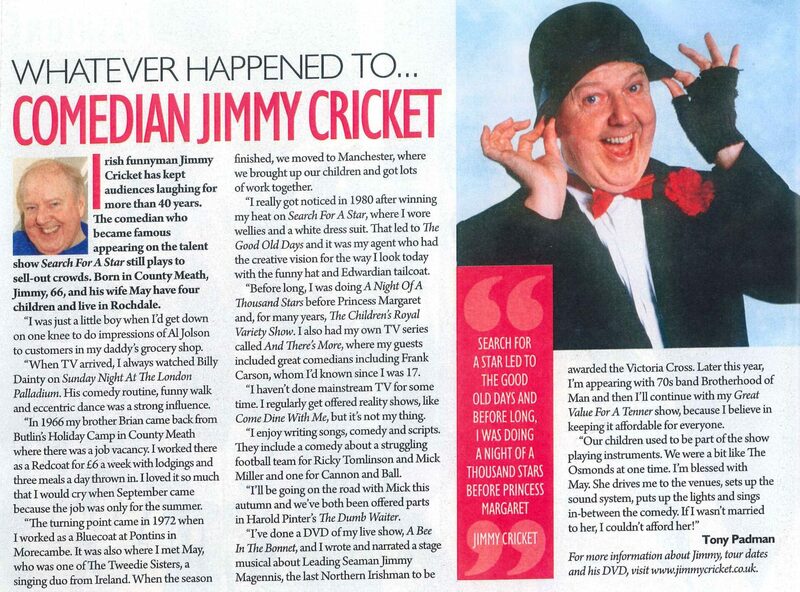 Jimmy Cricket is leading a return to the good old days in 2013. The famous Irish comedian will headline a national tour of a Music Hall Show which is being produced by Mark Andrews Productions. It will feature all the typical hallmarks of a ‘Good Old Days’ format, complete with a chairman who will throw out to the audience some linguistic challenges! The show, called The good old days of Music Hall and Variety, will visit the following UK towns and cities during next year: Shrewsbury, Billingham, Stockport, Derby, Cheltenham, Cleethorpes, Tunbridge Wells, Swansea, Ipswich, Kings Lynn, Skegness, Cardiff, Redhill, New Brighton, Nottingham, Dudley and Harlow. More details for each date can be found within the tour dates section of this website. Please note that most performance times are scheduled for the afternoon, but there is the odd occasion when an evening show has been arranged in addition to the matinee performance. 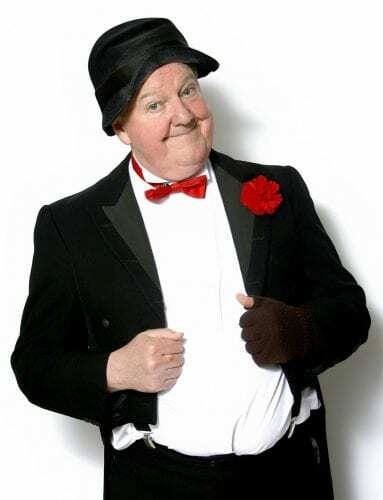 Famous Irish comedian Jimmy Cricket relived his successful showbiz career in a recent article in a British national newspaper. The feature, written by Tony Padman, appeared in the magazine section of last Saturday’s Daily Express.